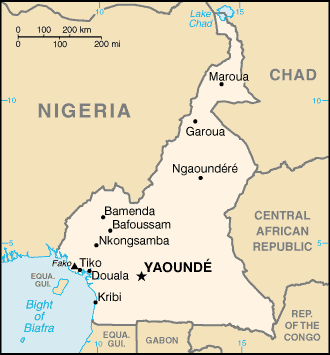 Cameroon, officially the Republic of Cameroon, is a country in Central Africa. It is bordered by Nigeria to the west and north; Chad to the northeast; the Central African Republic to the east; and Equatorial Guinea, Gabon and the Republic of the Congo to the south. Cameroon's coastline lies on the Bight of Biafra, part of the Gulf of Guinea and the Atlantic Ocean.